What Has MSA Done For You? In 1981 there were the following state associations in Michigan! Snowmobile manufactures were dwindling, sponsorship money getting tight. Who or which association needs more sponsorship money, MUPSA, where the snow is, MARS, where the snowmobilers live, MISA where the snowmobilers race and provide R&D. DNR, could not cope with all the demands from the three different associations. All wanted something different from the state. June 1982 MSA was incorporated and in September 1982 it had 36 individual members. January 1983 had agreement from MISA and MARS to transfer their respective recreational snowmobilers to the new MSA. February 1983 MSA had its first general membership meeting, 232 individual members. March 1983 MUPSA joined with MSA to complete the new association. 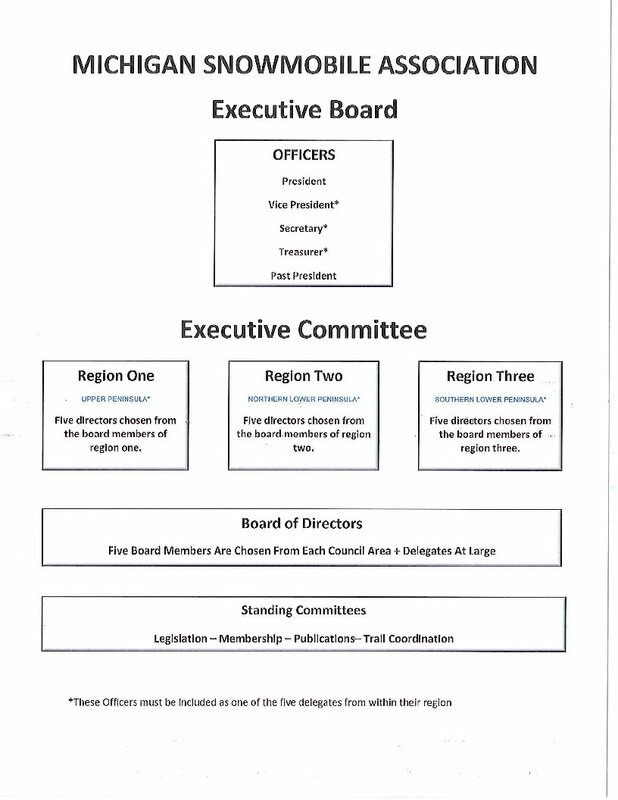 May 1983 first full board of directors meeting held in Marquette with 16 council areas represented. February 1984 MSA held its second annual meeting in Cadillac. MSA now has 908 members and 18 council member areas. Hot button issues at the convention were 3 wheeler issues on trails, get a return of gas tax dollars, early retirement from DNR, new out of state user fees. December 1984 with pressure from the UP lodging facilities and MN, WI, IN, and OH saying they would boycott the state snowmobile trails, on the last day of the legislative year they remove the Out of State Permit. May 1985 the four manufactures through the International Snowmobile Industry Association (ISIA) hire a Michigan lobby firm to assist MSA in getting a gas tax or permanent funding for the trail system. December 1987 The Michigan Legislature passes the Recreational Improvement Fund (RIF). Two percent of the tax on all gasoline is deposited into the fund. The distribution is as follows; 80% to the Recreational Boating Program, 14% to the Snowmobile Trail Improvement Fund, 6% to be used by others with consideration of restoration of damage caused by ATVs. December 1989 Membership stands at 4,800 and the topic of the day was increased fuel costs. March 1991 MSA working with legislators pass legislation to revise the current registration law and direct funds to SOS, Law Enforcement, and trails also passed was a mandatory registration at time of sale and mandatory helmet use. August 1991 MSA uttered the first words since 1985 called it a Snowmobile Trail Permit, this would add funds from Mi residents as well as out of state snowmobilers. March 1993 Legislation introduced to raise the registration fee to $22, full increase going to Grant Program for sheriffs. Other issues in the law change are retaining the interest on the Snowmobile Trail Improvement Fund. (STIF), a fine for stealing snowmobile trail signs, and introduction of a Trail Permit Fee. May 1994 Legislation passed for a Michigan Trail Permit for $10.00 per year Snowmobile Advisory Committee also put into law. Registration numbers removed from side of sleds. March 1995 Laws change to allow a snowmobile trail along an active RR with owner’s permission. April 1995 Fisherman want permit law changed to exempt them. June 1995 American Council of Snowmobile Associations formed, International Snowmobile Manufacturers Association formed, first lawsuit to end snowmobiling in Yellowstone filed by the Fund for Animals. March 1996 Sled dogs on trails was the talk of the time. July 1997 Registration decal changed and numbers added to decal. Stud Ban is first talked about. September 1997 New sign manual for trail is enforced. October 1997 MDOT working on road crossing tests for stud damage. December 1997 MSA votes to support studs and there use on trails. April 1998 MSA hires Reith Reily to do research on stud resistant asphalt. September 1998 Legislation tying Drivers license to snowmobile DUI passed. April 1999 Yellowstone lawsuit now cost over $100,000 to defend. March 2000 First season of Zero Tolerance Campaign under the belt with fairly good results. April 2000 Four years have passed without a new route around Mullet Lake on the Gaylord to Cheboygan trail. DNR contacted and reminded of their promise to find alternative route if snowmobile use could be curtailed along the lake trail in back of houses. December 2000 Bills introduced a bill to raise the TP to $20 for 2001 and to $25 in 2004. April 2001 House passes fee increase, headlight bill. April 2002 We saw one of the strangest winters ever, Dec, Jan, Feb, no snow, March lots of snow. May 2002 Test plots of the new stud resistant asphalt are being put on trails throughout MI. December 2002 Mullet Lake issue was taken to the NRC where they danced it over the Trust Fund Committee. March 2003 Legislature takes $7.5 M from boaters to balance the budget. Close call for a raid on snowmobile funds. April 2003 Assumption of risk clause passes and signed into law. August 2003 The US Congress holds a vote to end snowmobiling in Yellowstone and a tie vote defeated the measure, close call! September 2003 had a committee set up to review the Mullet Lake issue, 12 meetings every two weeks. August 2004 Mullet Lake issue has recommendation to go through Pigeon River Country. September 2004 MSA begins work on a non profit for permanent trails. October 2004 Snow Country Trails Conservancy formed to hold easements for snowmobile clubs across private property. November 2004 Snowmobile Funds are Constitutionally Protected 324.2025 Snowmobile account. Sec. 2025. (1) The snowmobile account is established as an account within the legacy fund. (2) The snowmobile account shall consist of both of the following: (a) All money in the recreational snowmobile trail improvement fund, formerly created in section 82110, and the snowmobile registration fee fund, formerly created in section 82111, immediately prior to the effective date of the amendatory act that added this section, which money is hereby transferred to the snowmobile account. (b) Revenue deriving from the following sources: (i) Revenue from fees imposed for the registration or use of snowmobiles. (ii) Revenues derived from the use of snowmobile trails. (iii) Transfers from the recreation improvement account. (iv) Other revenues as authorized by law. (3) Money in the snowmobile account shall be expended, upon appropriation, only as provided in part 821 and for the administration of the snowmobile account, which may include payments in lieu of taxes on state owned land purchased through the snowmobile account or the former snowmobile trail improvement fund. (4) Money in the snowmobile account may be expended pursuant to subsection (3) for grants to state colleges and universities to implement programs funded by the snowmobile account. CONTENT House Joint Resolution Z (H-2) would amend Article IX of the State Constitution to do the following: — Create the “Michigan Conservation and Recreation Legacy Fund”. — Require the State Treasurer to establish within the Legacy Fund specific restricted accounts (which, under the House bill, would replace funds created by statute). — Require money in the accounts to be spent only for specific purposes (which would parallel those identified in statute for the existing funds). — Establish the Michigan Game and Fish Protection Trust Fund and the Michigan Nongame Fish and Wildlife Trust Fund within the Constitution. House Bill 5870 (H-2) would amend the Natural Resources and Environmental Protection Act to: 1) — Provide in statute for the Legacy Fund and the restricted accounts proposed by House Joint Resolution Z (H-2). — Transfer to those accounts the balance of the existing funds that the accounts would replace. — Dedicate to the accounts the revenue that presently is credited to the existing funds. The bill also would re-establish the existing Game and Fish Protection Trust Fund and Nongame Fish and Wildlife Trust Fund as the Trust Funds proposed by the joint resolution. Those Trust Funds would consist of the assets of the Funds before the bill’s effective date, and would receive the same revenue that the existing Funds receive. The bill is tie-barred to the joint resolution. House Joint Resolution Z (H-2) Legacy Fund Establishment of Fund & Accounts. The joint resolution would create the Conservation and Recreation Legacy Fund. The State Treasurer would have to establish within the Fund restricted accounts as authorized by the resolution, and could establish additional subaccounts as authorized by law. Interest and earnings accruing from each account or subaccount would have to be credited to that account or subaccount. The State Treasurer would have to direct the investment of the Fund, and could receive gifts, grants, bequests, or assets from any source for deposit into a particular account or subaccount. The assets of the Fund would have to be invested as provided by law. The joint resolution would establish the following accounts within the Legacy Fund: — Forest Recreation Account —Game and Fish Protection Account — Off-Road Vehicle Account —Recreation Improvement Account —Snowmobile Account — State Park Improvement Account — Waterways Account Forest Recreation Account. January 2005 DNR appoints Deputy Director to head up the Snowmobile Trails Advisory Workgroup. February 2005 FWO raises $148,500 for Easter Seals-there was No Snow for the ride. March 2005 Gov Granholm vetoes bill to allow a trail in the interstate ROW, voiding a possible link around the Mullett Lake issue. September 2005 Gaylord to Cheboygan workgroup is disbanded with the Mullett Lake trail issue not resolved. October 2005 Three Million $ raided from Harbor Development fund. October 2005 Recreationists in MI solicit signatures for a ballot proposal for the 2006 November elections to Constitutionally Insure Protected Funds from any raids by the governor and legislature. Enough signatures are collected for Proposal One to be added. November 2005 Financial Intuitions (BANKS) want to make snowmobile have a title along with their registrations for lien purposes. December 2005 Still no trail on the RR grade along Mullett Lake, and therefore no connection after Indian River to Cheboygan. January 2006 Governor signs legislation to allow a snowmobile trail on a limited access Highway ROW with restrictions. January 2006 MSA wins and Snowmobiles are allowed on the Chocolay Twp RR grade with a 35 MPH speed limit for the 9 miles through the Twp. September 2006 MSA asks the membership for their opinion about raising TP fees. October 2006 MSA works with and the Governor directs the Director of the DNR to allow snowmobiles on the Gaylord to Cheboygan RR grade along Mullett Lake with a speed limit and curfew. November 2006 MSA in the state and National elections are recognized as a large block of the “Snowmo-Vote” by the national news media. November 2006 Proposal 1 passes that will now constitutionally Protect All Recreation Funds from a raid by the Governor or the Legislature. February 2007 FWO is twenty years old and raised $173,850 this year and $1,920,245 over the last 20 years. March 2007 MSA working on a 10 year budget for the snowmobile program with the DNR. September 2007 DNR revises Grooming Handbook and reneges on deal to allow the clubs to keep old groomers. state. The grooming program is funded entirely by snowmobile trail users, and not from tax dollars. the non-profit groups to obtain personal bank loans for purchase and maintenance. groomed over 352,048 trail miles, during a season with poor snowfall. October 2007 MSA is 25 years old. November 2007 MSA & Clubs say unless DNR holds up their end of deal they will not groom this winter. How the equipment is funded to the grant sponsors is the issue. December 2007 DNR and Grant Sponsors reach a compromise, grooming will go on and the clubs will get their original investment into grooming equipment back from the program. 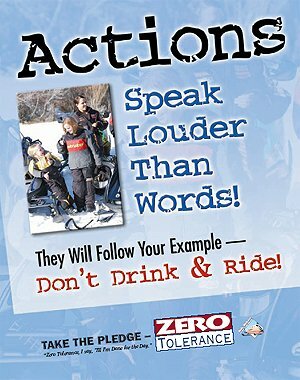 January 2008 Legislation passes to limit sound from snowmobile to 88db on stationary snowmobiles. Piped sled will be outlawed. Snowmobiling thrives in Michigan because of our picturesque natural resources and our superb trail network. The trails are maintained by grooming equipment purchased with fees collected almost entirely from snowmobilers. This is part of the process known as the “snowmobile program,” which ensures the viability of the industry. The Department of Natural Resources (DNR) is a part of the process, but not a funding source. The program is not funded through the state’s general fund derived from the taxpayers. The state gasoline tax provides a portion of funding, but the vast majority of money used to groom (smooth), sign, and maintain the trails come from 1. Trail permits, and 2. Snowmobile registrations. All three funding streams sent $7.3 million to the DNR this year. In typical government fashion the department used $2.1 million for “administrative costs” needed by the Forest Mineral Fire Management division to operate the snowmobile program. It’s not entirely clear to the snowmobiling community why the department needs over 28% of the budget to manage the program. It’s necessary to clarify these issues due to recent state government communications stating that grooming is “funded through the DNR” and that “the DNR pays for the equipment that the clubs use to groom the trails.” The DNR does not pay for the equipment used to maintain our trails. As outlined above, most of the money comes from snowmobilers and to a lesser degree the gasoline tax rebate formula for recreational vehicle use. Trail maintenance money is simply passed-through the DNR from users. It’s mandatory under state law. Snowmobilers and the businesses that rely on the industry do not have the DNR to thank for our world-class trail network. We pay for the necessary equipment and provisions. And more importantly, volunteers physically groom the trails. Without their tremendous contributions our trail system as we know it would not exist, and consequently neither would the economic stimulus generated by the snowmobile industry. It’s important to set the record straight for the future of snowmobiling in Michigan. The time is fast approaching when trail user fees will have to be increased to pay for the snowmobile program. The DNR will undoubtedly insist on being a part of that process too. As illustrated by the recent astronomical miscalculation of the Game and Fish Fund, we all have good reason to be reticent of the DNR’s ability to accurately forecast program budgets. If snowmobilers are faced with increased user fees, they will deserve to know why. The answers should come from dedicated industry experts, not from state bureaucrats. February 2008 MSA past officers start the Michigan Snowmobile Education and Advancement Fund (MSEAF) to work on all safety and education issues in Michigan regarding snowmobile safety. The 501(c)(3) corporation received it’s tax exemption from the IRS. July 2008 Passage of 2008 Public Act 240 makes it legal for specific counties, townships, cities and villages to adopt ordinances authorizing the operation of ORVs on the far right of the maintained portion of local streets and roads. Only counties in the northern Lower Peninsula and Upper Peninsula may open their roads to ORVs. This includes Mason, Lake, Osceola, Clare, Gladwin, Arenac, and Bay counties or any county to the north of them. Huron, Midland and Isabella counties are not included. The law took effect on July 17, 2008. September 2008 MSA has legislation introduced to raise the TP by $10 and the Registration by $8. November 2008 MSA unveils new addition to its web site, the Trail Report Page. December 2008 Governor signs fee increase legislation. The trail permit will raise for the 2009/10 & the 2010/11 season to $35 and then the 2011/12 through 2014/15 season to $45 per year. After that the permit will be adjusted by the CPI for inflation. Also the registration increased from $22 to $30 for a three year registration, all of the $8 will fund our permanent trail easement fund. October 2009 Governor Granholm abolishes Snowmobile Advisory Committee along with 25 other advisory groups. She orders a replacement with a seven member group made up of a hiker, biker, snowmobiler, skier, ORV, walker and an equestrian. MSA objects to 5 users with no funding put in place to manage and advise the uses of the Snowmobile and ORV funds. January 2010 Governor back peddles and orders a new Michigan Snowmobile and Trails Advisory Council (MSTAC) with nine members, four snowmobile, two ORV, 1 hiker,1 biker, 1 MUCC. October 2010 The Huron Manistee National Forest loses a lawsuit to a former Serria Club attorney, snowmobiling and hunting may be outlawed in those two forests. If allowed to stand snowmobile trails in the lower would be closed due to lack of continuity. March 2011 Forest Service decides to do a Supplemental Environmental Impact Statement and revisits forest plan for snowmobiling and hunting in the Huron Manistee National Forest. They will seek public input from snowmobilers and hunters. March 2012 NFS rules that all charges are unfounded and stays snowmobile and hunting in the Huron Manistee National Forest. May 2012 Working with DNR on a Statewide Snowmobile Trails plan. The Department of Natural Resources announced today that snowmobile and off-road vehicle (ORV) trail riders will soon notice a reduction in the types of trail markings along the more than 10,000 miles of Michigan’s designated motorized trail system. The DNR implemented these changes to improve safety and provide consistent guidance to the more than 90 non-profit organizations that maintain the trails. Oct 2012 trail summit at the RAM center. MSTAC, Natural Resources trust Fund Board, Waterways Commission, State Parks Advisory Committee, Michigan Historic Center. Facilitated session to identify common goals, trends, and priorities. Nov 2012 DNR Law Enforcement’s Strategic Planning Meeting. Was on panel for discussion on relationships, partnerships, and changes. Dec 2012 Worked with Snow Country Trails Conservancy to save trail #8 east of Three Lakes, purchased land and provided easements to Moose Country and Baraga grooming groups. Jan 2013 MSA is on committee regarding the Public Land Management Strategy Committee. Feb 2013 Guided Congressman Huizenga on his Town Hall Meetings via snowmobile. Excellent press on this ride, both Michigan and National. April 2013 National Forest Service in Idaho loses lawsuit. Lawsuit will require all NFS regions to add Over the Snow Vehicles to their Travel management Plans. Short story, all NFS land could be CLOSED unless posted open to snowmobiles via a travel management plan. Dec 2015 MSA fought to keep trail 422 to Miners Castle open and won. A reroute is in the works. Just a few of the reasons to join MSA, without a strong membership we can not continue the work that needs to be done to enhance and protect our riding privledges!